Friends..Here are the Important Current Affairs Updates for 15 August 2015. 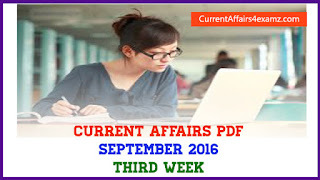 Also Check Current Affairs Quiz 2015 to sharpen your preparation. 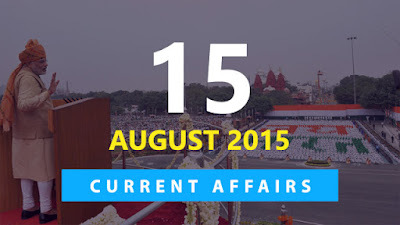 --> India has celebrated its 69th Independence Day on 15 August 2015. --> Independence Day has great significance because it reminds the people of the unity and diversity of India. --> It is the day when India became free from the British Rule after 200 years of slavery. --> PM Narendra Modi addressed the nation from Delhi's iconic Red Fort. --> Saina Nehwal has became the first Indian to reach the finals of the World Badminton Championships at Jakarta with 21-17 21-17 win over Indonesia's Lindaweni Fanetri in the semifinals of the women's singles on 15 August 2015. --> World No. 2 Saina will now take on defending champion and World No. 1 Carolina Marin of Spain in the summit clash on 16 August 2015. --> In an extraordinary twist to the game, India on 15 August 2015 capitulated to an embarrassing 63-run defeat in the first cricket Test against Sri Lanka, who scripted one of the most remarkable turnarounds in recent Test history. --> Set a tricky victory target of 176, the listless Indians surrendered tamely to be skittled out for their lowest score of 112 in just 49.5 over to give the islanders a 1-0 lead in the three-match series. --> Left arm spinner Rangana Herath scalped 7/48 and Tharindu Kaushal took 3/47 as the lankans bamboozled the Indians to bundle them out in just 41.5 overs. --> In a first ministerial trip to India, after Iran struck a nuclear deal, its Foreign Minister Jawad Zarif is now in New Delhi and he called on PM Narendra Modi on 14 August 2015. --> On the eve of celebration of 69th Independence Day at Red Fort Prime Minister Narendra Modi announced a new campaign ‘Start-up India; Stand up India’ an initiative to promote bank finance for Start-ups (an entrepreneurial venture). --> The campaign was announced with an aim to boost entrepreneurship among the youth and to create employment in India. --> As per the initiative PM urged 1.25 lakh bank branches to provide finance to at least one Dalit or Adivasi and at least one woman entrepreneur. --> Wrestling coach Anoop Singh and Paralympics coach Naval singh were among the five names recommended for this year's Dronacharya Award by a selection panel on 14 AUgust 2015. --> Anoop and Naval were recommended on the basis of current performance (2011-2014), while Nihar Amin (swimming), S R Singh (boxing), Harbans Singh (athletics) were considered in the 'Lifetime Achievement Category' in which achievements over a period of 20 years is taken into account. --> India’s third largest private sector lender, Axis Bank has launched the first Contactless Debit, Credit and Multi-Currency Forex Card in association with VISA payWave in the country. --> Axis Bank will offer a contactless debit/credit cards to its 1.7 million premium customers which also enables withdrawal of 15 currencies via Multi-Currency Forex facility. --> Union Government’s ambitious Pratyaksha Hastaantarit Laabh (PAHAL) scheme has been acknowledged as the world’s largest cash transfer program (households) by the Guinness Book of World Records. --> The founder of Hero Cycle and a leading industrialist Om Prakash Munjal breathed his last in the DMC Hero Heart Centre, Ludhiana on 13 August. --> The complete manufacturing of bicycle was started in 1956 under brand name Hero. --> This unit became the first bicycle manufacturing unit in India which produced 639 bicycles in that first year. --> President Pranab Mukherjee has conferred prestigious literary award Saraswati Sammaan for the year 2014 to Dr. Marpadi Veerappa Moily in New Delhi. --> He was bestowed with this award for his Kannada poem ‘Ramayana Mahanveshanam’ which was first published in 2007.